This season, one piece swimsuits are taking over with styles such as cut-outs, monochromatic, color block, classics or edgy. Get the perfect beach look by rocking one of these swimsuits and adding your best accessories. 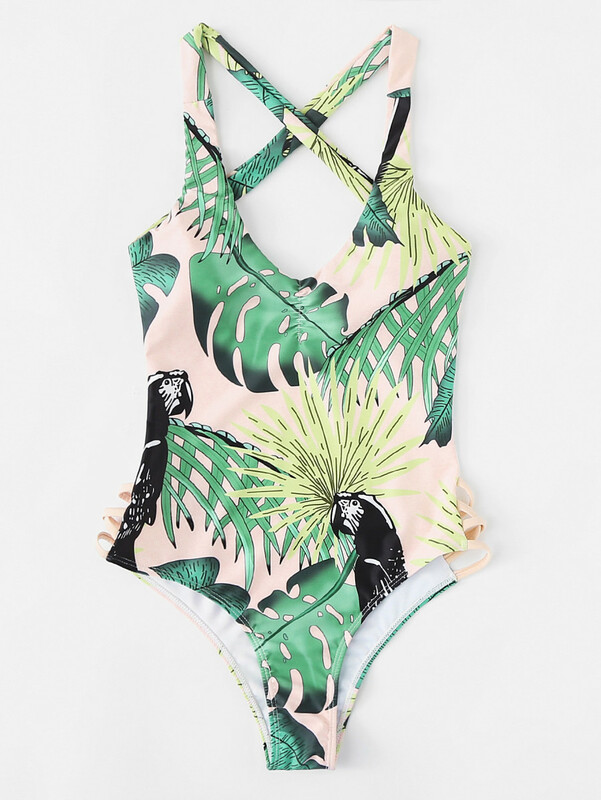 Tropical one piece with a criss cross palm decoration. Stunning and sunshine-ready swimsuit with removable straps so you can switch up the style and fit. The perfect swimsuit to show off your curves featuring a strappy one shoulder construction, front and back cut-outs and a high cut leg. This season the trends on bikinis are crop tops, high-leg, high-waist, straps, floral and tropical prints, new material and sport look. A beautiful and unique stretchy smocked fabric top that you won't be able to wait to wear at the beach. A gingham print bikini featuring a bandage crop swim top with off the shoulder sleeve and choker neck and high cut leg bottom. Stunning multi-colored striped bikini set with a push up top and high legged bottom. A soft, resistant stretch fabric bikini top featuring shiny effect fabric and a stunning open back. Tropical blooms enhance the feminine charm of this ruffled overlay, off shoulder bikini top. Enhanced by tropical blooms this bikini top.is perfect for a getaway destination. A chic bikini with a crochet knit design, contrast trim and back self-tie closure with tasseled ends.